On this screen you can set a number of Options organized by tabbed sections that must be used the first time you run VCDS on a PC. Vbat: The unswitched power to the DLC. VIgn: The switched power to the DLC. If any of the results show "Short to Ground" or "Short to +12V" then you should test the port in the car using instructions found on the Aftermarket Radio Page. On Legacy Dongle Interfaces, the [LEDs] button causes the LED on the Interface to blink and may be useful for testing a port's outputs for troubleshooting certain connection issues. 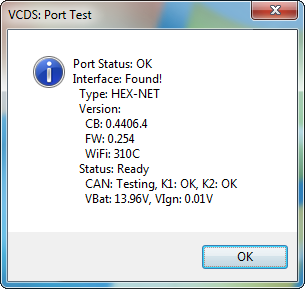 On the HEX-NET or HEX-V2 the [Config] button is used to launch the VCDS Interface Config utility which is used for updating the firmware in the interface, registration, WiFi configuration and other functions. Start Baud is the first baud rate that VCDS will try when connecting to a controller. The current default value is 0. This means VCDS will determine the correct start baud on its own. With our current Interfaces, this field is unavailable. KW2 Delay has to do with the amount of time used during the initialization of a session between the PC and the car. The current default value is 30. Do not change this value from the default unless you are having difficulties communicating with a particular controller. Contact us for advice if you are. TST Addr. has to do with the packet addresses used by KWP-2000. The current default value is -1. Do not change this value from the default unless you are having difficulties communicating with a particular controller. Contact us for advice if you are. Debug Level controls how much debugging information VCDS records. A zero in this field (the default) means NO debug output will be generated whatsoever. This should decrease VCDS's susceptibility to interference by things like virus scanners (except when logging data). There should be no reason to set Debug to anything other than zero unless you are instructed to do so by Ross-Tech. Blk Int affects the protocol timing. The current default value is 55. To get the highest sample rate possible in the Measuring Blocks screen, set this to 25. Note, however, that this may cause unreliable communications with some controllers. Char lnt 2K / Char Int also affects the protocol timing. This is called Char Int 2K and the default value is 6 when used with a HEX-NET or HEX-V2. This is called Char Int and the default value is 1 when used with a legacy interface. To get the highest sample rate possible in the Measuring Blocks screen, set this to 0. Note, however, that this may cause unreliable communications with some controllers. KP2 Time only applies to controllers using the KWP-2000 protocol. The current default value is 25. Decreasing it increases the sample rate in Measuring Blocks on control modules that use the KWP-2000 protocols. The default value should work for all applications, but if it does not, you can always increase it again (to a maximum of 99). CAN Timeout defines how much longer than normal VCDS is going to wait for the module to respond to a given message. Do not change this value from the default value of zero unless you are having difficulties communicating with a particular controller. Contact us for advice if you are. Bypass OBD-II Fastinit should only be checked if you are experiencing difficulty connecting to a vehicle using generic OBD-II. The default state for this box is unchecked. Force K on Engine is used on Engine controllers that have a choice of using CAN-Bus or k-line for diagnostics, such as the Mk5 Jetta 2.5l. This feature can be useful since the K-line often delivers faster sample rates while datalogging than does the CAN-Bus on modules that support both. Since some modules talk only via CAN, this box is unchecked by default. Bypass CAN Init should only be checked if you do not want VCDS to try connecting to vehicles using the CAN-Bus. The default state for this box is unchecked. Boot in intelligent mode allows VCDS to quickly determine baud rates when using a HEX interface. If you wish to try using your Ross-Tech dongle interface with 3rd party software (which is not supported by Ross-Tech), you may want to run a Test, then uncheck Boot in intelligent mode then run another Test. This will cause the interface to behave like an older style dumb interface and will not be compatible with most 6J Ibizas and it will be noticeable slower building the list of installed modules on the Select Control Module screen. The default state for this box is checked. With some of the newest interfaces, this may be labeled as Forced Dumb Mode and is UNchecked by default. The HEX-NET and HEX-V2 do not have this option since they don't support "dumb mode" or 3rd party software. Reduce CPU Usage checkboxes will greatly increase responsiveness of other apps running at the same time as VCDS. The disadvantage is a somewhat reduced sample rate. KWP-1281: The default state for this box is unchecked. This reduces CPU usage when connected to controllers using KWP-1281. Using this feature *may* make the session with some control modules unreliable. [Restore Defaults] will reset all Protocol Options (except WorkShop Code and VZ/Importer number) to their "as-delivered" settings. If you right-click on the VCDS icon on the top left of the VCDS screen, you can select �Delete config file and close�. This can be very handy, especially if you have made the window size too large. Shop Name is displayed on reports, such as the Fault Code Report. The WorkShop Code (known as the WSC) is found on the Admin screen of a dealer's VAS-5051, as well as on the dealer's stamp. The default value is 00000. For example, using the stamp below, the dealer's number is 401/742. To derive the Work Shop Code, drop the first digit and use the remaining digits in order. So, Evergreen Terrace Volkswagen has a WSC of 01742. This only applies to US VW dealers. Canadian dealerships use a 4-digit number on their stamp. To find the WSC, place a 9 before their number. Note: If you are an individual user or independent mechanic, just leave the WorkShop Code set to "00000". This allows VCDS to operate in �stealth� mode, keeping whatever WSC that was already in the controller. If you are using VCDS at a Dealership, enter your Dealer's Workshop Code. The Work Shop Code is not easily changed once set on this screen. Contact us for advice if you need to do so. Some control modules do not allow themselves to be Coded with the default 00000 WSC in place. VCDS should prompt you with a message to input non-zero values in such cases. You should NOT make such changes in the Options screen itself. The VZ/Importer number is essentially a "region code" extension to the Work Shop Code (should be 444 for US, 999 for Canada). The default value is 000. Note: If you are an individual user or independent mechanic, just leave the VZ/Importer number set to "000". This allows VCDS to operate in �stealth� mode, keeping Importer number that was already in the controller. If you are using VCDS at a Dealership, enter your Dealer's VZ/Importer number. The VZ/Importer number is not easily changed once set on this screen. Contact us for advice if you need to do so. Some control modules do not allow themselves to be Coded with the default 000 Importer number in place. VCDS should prompt you with a message to input non-zero values in such cases. You should NOT make such changes in the Options screen itself. The Equipment Number field is used most often when coding new control modules. Some control modules will refuse being recoded if they're not given an equipment number (sometimes they require a non-zero WSC and Importer number too). The default value is 00000. Some control modules do not allow themselves to be Coded with the default 00000 Equipment number in place. VCDS should prompt you with a message to input non-zero values in such cases. You should NOT make such changes in the Options screen itself. Left Margin Printing This is the number of spaces that printed pages are shifted to the right. Window Size This function allows you to change the apparent size of the VCDS window on your screen. Adjust this in small increments since it is possible to make VCDS so large that it is much bigger than your screen! To see the resizing take effect, click Save, then close VCDS. When you restart, the new window size should be shown. Disable Sounds Checking this box will prevent VCDS from making sounds when an operation is complete, for example at the end of an AutoScan or at the end of Acceleration Measurements. This will not prevent Windows sounds when an error message pops up. Prevent screen power savings while communicating Checking this box will tell Windows to not turn off the screen during a diagnostic session. Build list of CAN controllers prior to selection dialog This box is checked by default. 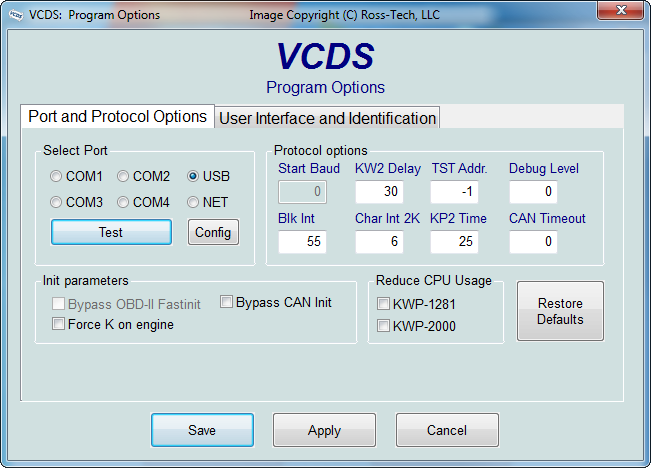 In CAN based cars that have a proper Gateway supporting an Installation List, VCDS will automatically populate one or more Installed tabs containing buttons for only those control modules that are actually installed in the car. It does take about 1.5 seconds to get the list from the Gateway, so a bit of a delay when clicking [Select] is normal/expected. Customers who use VCDS primarily on older cars which do not have an Installation List available may want to uncheck this box. If an internet connection is available, VCDS will notify the user when updates are available and will ask permission to download and install updates. Because we do not want to burden customers' PCs with a resource hogging update scheduler, VCDS will only check for updates when it is started and when the PC is rebooted. We've tried to make this as unobtrusive as possible -- VCDS will not complain if there's no internet connection available -- you just won't get updates. Select from the drop-down menu to determine if, and when VCDS should automatically check for updates when the program starts. You can also click the [Check for updates now] button to manually initiate a check. Note: Some 3rd-party firewall software may complain that VCDS is trying to access the internet -- if this happens you should either tell the firewall to allow it, or turn off Automatic Updates. [Save] causes the current options to be stored. Note that until you have Saved your preferences, all buttons on the VCDS Main Screen will be grayed-out except Options. [Apply] lets you use and test the options without storing them. The next time you restart VCDS, the options previously stored will be used. [Cancel] takes you back to the Main Screen without any effect.